In this mini-expansion, when you place one of the Magic tiles, you will be allowed to move either the Mage or the Witch, but they must be place on an unfinished structure and may not be place in the same structure. If a city or a road where the Mage is present is completed, each tile of the completed structure is worth 1 additional point. If you finish a road or a city where the Witch is present, you divide the number of points you where supposed to gain by 2 and only gain those points. So while the Mage is your friend, the Witch will surely ruin your plans. 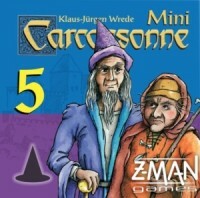 Add a Review for "Carcassonne: Mini-expansion #5 – Mage & Witch (Second Edition)"